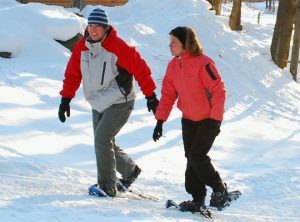 Vermont winter essentials are important for a fun winter getaway at Sterling Ridge Log Cabins. This is the time to get outside and experience the Vermont winter. Winter up north, if embraced appropriately, can be fun and adventurous. Appropriate gear is on the packing checklist for Vermont winter essentials; it will seriously bring the fun level up a whole notch with it. Check out our list of recommendations for enjoying your outdoor time at Sterling Ridge. Winter jacket: A warm, preferably waterproof, winter jacket. A jacket with a hood is not a Vermont essential but certainly adds to your level of comfort. Gloves – depending on what you are doing, you can choose from waterproof mittens or gloves. Knitted mittens or gloves are more for the outdoor fall excursion, not Vermont winter essentials. If you don’t need to use your fingers to grip things, mittens are best, since your fingers will stay warmer if they’re skin-to-skin. Hat –There is an amazing array of hats these days, from pompoms to toques. No matter which style you choose it will keep the heat in and help prevent hypothermia. Boots – Shoes and sneakers are only good for a comfortable drive up to Sterling Ridge in Vermont. Be sure to add warm, winter, waterproof boots with a pretty decent tread as part of your Vermont winter essentials checklist. Shirts – layers are always the way to go with your upper body. Fleece shirts, sweaters (wool over cotton) on top plus anything that is breathable underneath – the more the better. Remember, you can always take a layer off! Pants – It is always good to have casual pants (such as jeans and khakis), lounge pants (that are also good for layering underneath snow pants) and of course snow pants. Waterproof and windproof snow pants are part of Vermont winter essentials for a memorable time in the snow. Snow tires – If you’re driving, make sure your car has winter tires and preferably four-wheel drive (but not always necessary if you have a great set of winter tires). Remember, if there’s snow or ice on the road, slow down; even SUVs can skid off the road. Looking for local weather conditions? Visit VT511 or VTrans. Now that you have the Vermont winter essentials, you can get packing and be sure the car is ready for your Vermont winter trip. Sterling Ridge Log Cabin Resort is ready for you with a cozy cabin of your own to make winter memories to last a lifetime.